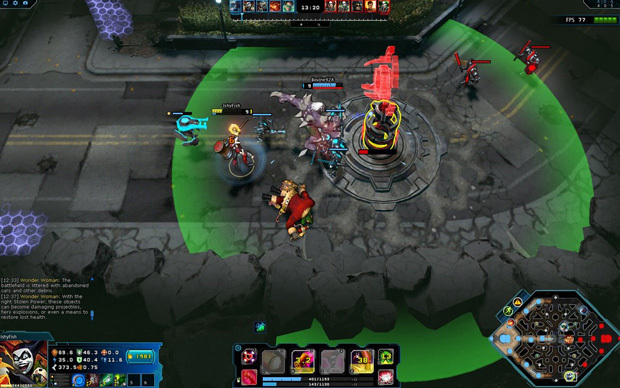 Specifically, what makes a successful MOBA? 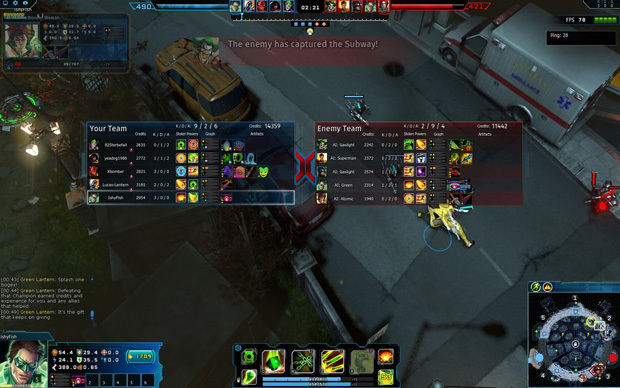 MOBAs are the popular Multiplayer Online Battle Arena style of game, such as League of Legends, DOTA, and SMITE. But what is it that makes some MOBAs successful while others fail? Just recently, Dawngate announced that it will no longer try to compete against Riot Games’ titan, League of Legends, and will be closing down in a little less than 90 days. Turbine meanwhile has an interesting title coming in Infinite Crisis, a DC Comics MOBA title that merges several alternate realities into one game. IC creates a “save the universe” goal while pitting players against one another in combat, pushing towers and trying to destroy the other base. But is one side or another clearly the heroes? If they are supposed to be fighting this ominous force, why fight each other instead? This is not made very clear at all. Let’s return to the main question about MOBA success. When the rash of World of Warcraft clones hit the market, every single one of them went free to play or simply disappeared. They were trying to fight against an established game with millions of players, expecting to have similar numbers right out of the gate. Fighting against titles like SMITE and League of Legends is the exact same problem. DC Infinite Crisis feels in many ways a clone of DOTA , and while MOBAs traditionally feel the same, a successful game will find a way to make its own mark. 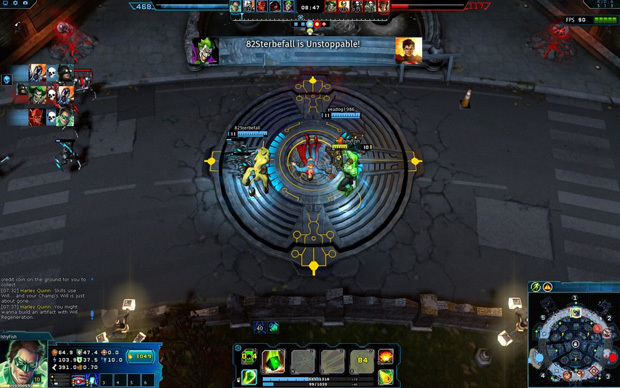 SMITE, for example, uses third person and skillshots as well as a variety of other techniques to be its own game. I feel sadly that there is a lot of confusion going on in this game for fans that are not comic book aficionados to start with. While Infinite Crisis scores big on solid gameplay and easy hero ability recognition for fans of DC, anyone else may feel a bit lost and overwhelmed when trying it out. In Brightest Day. . .
Thankfully calling out a game for only drawing in DC fans is a lot less niche than one might suspect. It’s a humongous intellectual property that has only grown its presence with the gamer community thanks to the recent barrage of movies and success of SOE’s DC Universe Online. Virtually everyone is familiar with at least one character in the DC Universe, whether it is Batman, Superman, Wonder Woman, Green Lantern, Flash, et cetera. But uninitiated MOBA fans might become overwhelmed piecing together the lesser known characters powers with the tweaked take on classic MOBA gameplay. The multiple universes only make this newbie learning curve steeper, as most will mistake the two variations of Batman as skins rather than unique heroes. Gaslight Batman is a ranged lane character. Nightmare Batman is more of an assassin, who isolates opponents before dealing hefty burst damage. Batman is … also a stealth based character, who gains damage when in stealth or on a stealth pad (IC’s version of a bush). Sure, character builds and skills are different between these similar characters, and having several Wonder Women, Supermen, and Batmen might mean that everyone can play their favorite hero each match. Maybe. But this could confuse someone new who sees three different Green Lanterns and not know how to deal with them. Trial and error (after error after error) is the only answer. Unfortunately the tutorial addresses most of the tedious basics that veteran MOBA players don’t need to be told again, but at least you get rewarded for your time with five hero unlocks (1 per mission). Gaslight Batman, Wonder Woman, Doomsday, Batman, and Green Lantern will be yours for going through this tutorial. At its core, Infinite Crisis is still a MOBA. Each of these characters has at least one skin. You still have lanes with turrets and minions reskinned to fit the DC Universe. Instead of a jungle, you have an “Urban Jungle.” The bushes are purple lengths of space known as Stealth Pads. Instead of monsters we have robots and mecha that fight for you or against you. 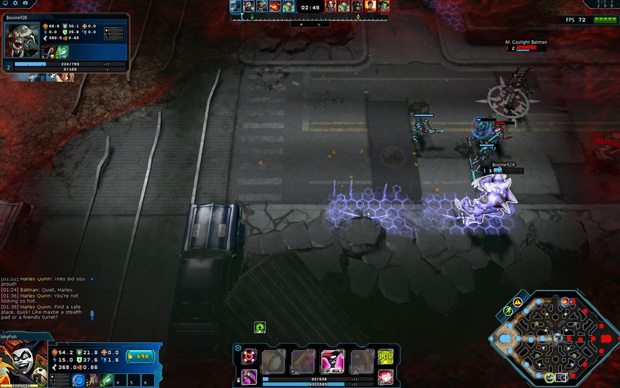 As with all MOBA titles, the goal is to ultimately destroy the enemy base by strategizing, pushing, purchasing items, and utilizing your character’s unique skills. One definite change that stands out is the ability to be able to buy items (called artifacts) while at one of your turrets, instead of going back to base. These artifacts upgrade as you spend credits on them, making them increasingly powerful. But you cannot restore hp/willpower by standing at a turret, or restore the use of your healing items. That must be done at the base. One particularly aggravating problem with Infinite Crisis’ gameplay is its lack of AFK punishment. In one match, a teammate failed to pick a character before the match began. Instead of dropping this player out of the game, however, the game randomly selected one and dropped them in the match. It’s an infuriating mechanic that peeved League of Legends players for years before it was fixed. Since the technology is available to prevent this from happening, I feel that Turbine is dropping the ball on dealing with AFKers. “It’s all been done” is a common argument used by existing MOBA players that prevents them from testing the competition. Abilities used in League of Legends are familiar and very visible in DC’s Infinite Crisis. 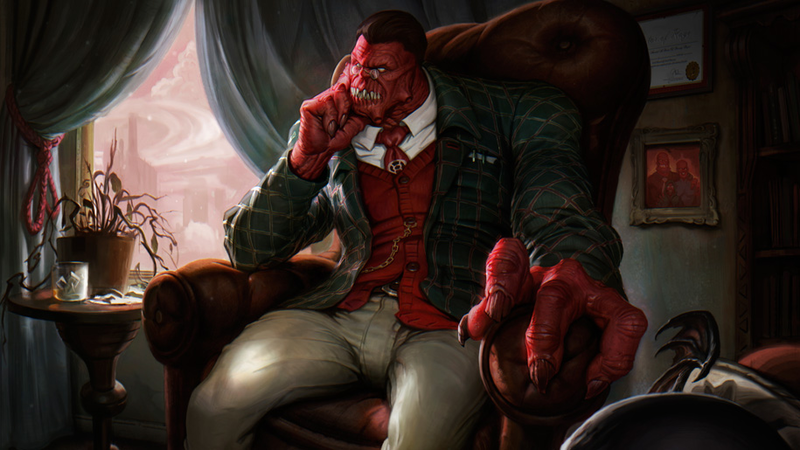 You will see common themes that also crop up in DOTA 2, possibly even Smite. But it can become very hard to find new ways to use abilities and powers, especially when there are so many MOBA titles going at this very moment with character rosters already in the 100s. So yes, many of these powers will not go unnoticed. The “summoner spells” (called “Stolen Powers”) however are a new take on extra spells. There are several of these and you can choose two at hero selection. As you continue to play a character over a series of matches, you can unlock their unique version of a super power. For example, playing as Catwoman will unlock her “Teleport,” while Gaslight Catwoman will receive her unique “X-Ray Vision,” letting you spot stealth enemies or see enemies hiding behind walls. Another good example is the Super Strength power. There are meteorites littered on the ground that can be picked up with this and thrown at enemies, or even automobiles! Incorporating the environment into battles is a very nice touch indeed. For players that don’t have the patience to grind it out on a single character, they can alternatively spend Merit (which is gained by playing and winning, or by completing achievements) on super powers in the shop. This is a nice motivator to get players to test out new heroes. Don’t think we forgot about customizing your character though! There are two additional items you can customize your character with, similar to Runes and Masteries in other games. They are Mods and Augments. Mods modify your item purchases, changing them in a variety of ways. This is kind of nice, because there are many of them to choose from, all of which cost Merit. Augments affect two stats at a time. These are much cheaper (merit-wise) compared to Mods. You find these on your home screen under “Amplifiers” instead of on the store directly. 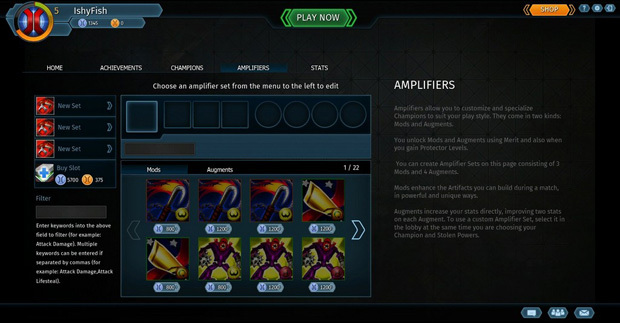 Your Amplifier pages can hold up to 3 Mods and 4 Augments, and accounts offer three slots for Amplifier pages (and another can be purchased for merit or Crisis Coins). Crisis Coins are the in-game currency that requires real money. 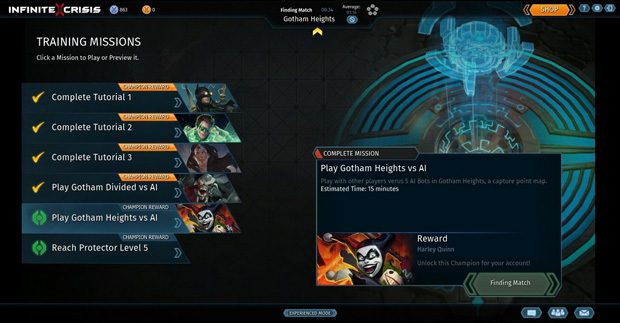 You can also gain Crisis Coins via Achievements in-game, and can also be used to purchase heroes. 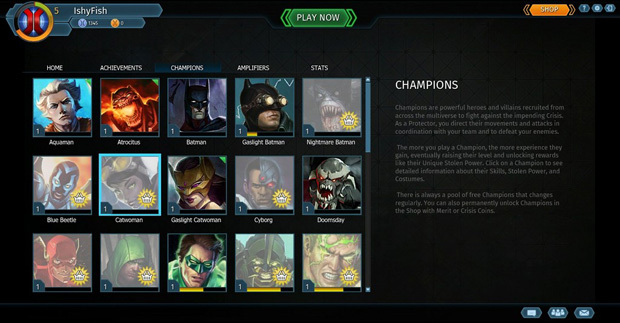 DC Infinite Crisis is in the extended end of its open beta at the time of this article. The game has been in development for quite some time, and while I do love MOBAs and comics, I am disappointed. The pretense lore for the game seems quite flimsy and does not appear to hold much sway over what actually occurs. There are so many characters in the DC Universe that are not in game yet. Instead of focusing on the alternate reality characters, perhaps they could have given a role to the less popular heroes and villains, and use it as a platform to get some other comics press (and thus more revenue)? I’m thinking of Booster Gold, The Question, Deadman, and Larfleez, just to name a few. I think the Alternate Reality thing could still work, but releasing a bunch of those characters all at once might become overwhelming. I would hate this to go the way of Dawngate, and it is with that in mind I say that trying to compete or overthrow established big guns at their own game in the genre is a fools endeavor. Focus on your niche and make it work! Infinite Crisis is certainly on the right track. I believe it just needs the right promotion and continued content updates to grow into its paws.